GoldUno is a one-stop-destination for getting quick cash against gold assets. It is an online lending platform, an aggregator where you can compare gold loan products from different NBFCs and Banks and choose the best deal among them. Researching for the best gold loan product near you is a daunting task which expends time, energy and effort. Why waste that when you can do all the research and apply for the best gold loan product from the comfort of your home. 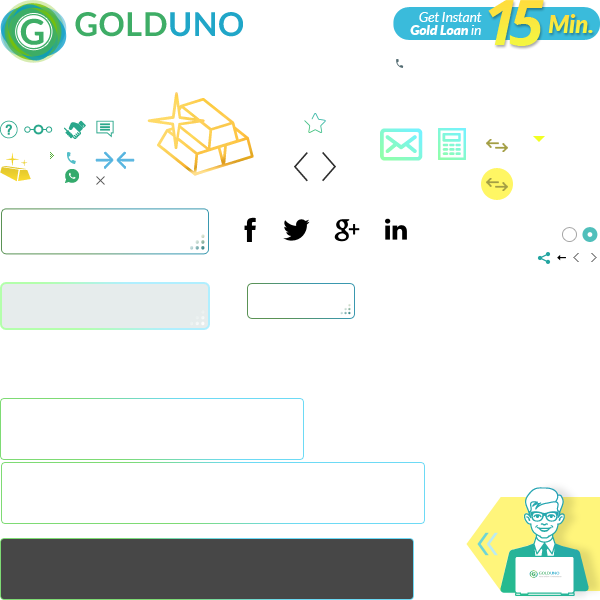 Golduno is the numero uno aggregator for gold loans. Using golduno, you can COMPARE hundreds of loan products, CHOOSE the deal that best suits you, and en-CASH your gold quickly. All services and subscriptions on golduno are FREE for users. A service fee is charged to the Bank/NBFC on successful disbursement only. What is the quickest and most efficient way to apply for Gold loan? A missed call. Yes, securing a gold loan with the help of golduno today is a missed call away. Ring us at 1800-313-1060 or go to GoldUno/apply.com Compare and evaluate from hundreds of lenders offering a myriad of products. Who can avail Gold Loan? Any Individual who is above 21 years of age with valid photo id and owns gold ornaments or jewellery can avail Gold Loan. What are documents required for gold loan? You need to provide address proof, photo identity and signature proof along with three passport size photographs. It's just a matter of 30 minutes. After testing purity of your gold, you need to submit all your documents and you will get your money. You can pledge any type of gold jewellery within 18 to 24 karat. Please note, some banks does not offer loan against gold coins. Also, the weight of stones etc. fixed on the ornaments will be deducted for the purpose of valuation. What is the minimum purity of gold required? The minimum purity required for gold loan is 18 carat. You can get loan of any value from Rs 1,000 to Rs 1 crore. You can get loan of maximum 75 percent of your gold value. How much of the loan amount I can get in cash? You can get upto Rs. 1 lacs in cash and then get cheque for further amount which varies with lenders. Yes, you will have to pay processing fees upto 1.5 percent and valuation fees for testing purity of gold. What will be the gold loan tenure? Gold loan generally available for a short-term period, from 6 to 12 months. But, some of the banks or NBFC's offered it for a tenure starting from 6 months to 48 months. Do I need to have an account with the bank? No, it is not required to have an account with the lender. How can I repay my gold loan? You can repay the loan by cash, cheque, DD or through funds transfer (NEFT/RTGS). What are the types of repayment? INTEREST ONLY: Borrower pays only simple interest on the principal amount every month. At the end of the tenure, the borrower pays the principal and closes the loan. EMI: A fixed payment amount made by a borrower to a lender at a specified date each calendar month. Equated monthly installments are used to pay off both interest and principal each month, so that over a specified number of years, the loan is paid off in full. BULLET: Bullet is where payment of entire principal and interest is made at the end of the loan term. Will I get repayment reminders? Yes. After loan disbursal from lender just confirm your loan details with our loan advisor. We will update your account with the repayment schedule and send you timely reminders in a medium of your choosing (SMS, email, call) for FREE. What happens if the loan amount is not repaid on the due date? If you fail to repay the loan amount on or before the due date, penal rate of interest is charged on the loan amount. Penal rate of interest will be applicable according to the terms of your gold loan agreement. What happens if I am not able to repay my loan amount? In case, you failed to repay your loan then the Bank's or NBFC's will auction your gold assets. But, it will happen only after giving you sufficient notice. They will also send auction intimation prior to the auction. Can I foreclose my gold loan account? Will there be any charge for the foreclosure? Yes, you can foreclose the loan account anytime. But, some Banks/NBFC's have their lock-in-period (around 1 & 1/2 months) after that you can start foreclosure process. You can end up by paying 0-1 percent for foreclosure, depending which banks you selected. Yes, most of the Banks provides overdraft facility that will be valid for a period of 12 months. You can utilize funds to the extent limit of sanctioned based on the value of gold, which is being pledged. You will be contacted by our loan advisor to go over the gold loan product you chose. The loan advisor will share the details of closest branch near you and schedule an appointment for you with branch associate. You will briefed again about the required document, loan parameters like expected loan amount, gold required as collateral. Once applied how to cancel loan application? After applying for a loan, you will be contacted by our loan advisor to finalize your application and schedule appointment for you. You can request cancellation during this call or get in touch with us anytime later here. How to change loan product in application? Please get in touch with us for any revision to your loan application. We will be happy to sort it out for you. You can reach us here. Different schemes of Banks/ NBFC’s have different interest rates. Rates of interest generally varies from 10 to 17 percent. Click Here to compare/know Bank/ NBFC's interest rates. How is the interest on my gold loan calculated? You will be charged simple interest, which is fixed and is calculated on reducing balance basis. LTV is the amount of money you can take as loan by keeping gold as collateral security. i.e percentage of loan value to total value of gold. The loan to value ratio may depend on the type of ornaments and rate of interest.An easy example, you have Gold worth Rs 1,00,000 of the market value, and then you are eligible of getting loan of Rs 70,000 (that is 70 percent of the Gold value). The remaining 30% value of Gold loan becomes cover for the borrower's assets. Is there any pre-payment or part payment charges? Most of the Bank's/ NBFC's does not charge any amount for pre-payment or part-payment. You can pay anytime to reduce the burden of interest on the loans as interest is calculated on daily product basis on the amount of loan outstanding at the end of the day. Whereas, some banks charges you pre-payment fees of up-to 1%. Yes, you will be charged additional costs for late payment charges, which will be applicable according to the terms of your gold loan agreement. Hence, it is advisable to read terms of your loan agreement before processing and make timely payment. How golduno protects your information? I have unanswered questions, what to do? Let us know! We would love talking to you. Give us a missed call at 1800-313-1060 and we will call you back. Or chat with us on WhatsApp +91-730-321-8881.